PASIG CITY, Metro Manila - It may look like just another statue of Rizal, but Pasig City's Rizal monument is unique. 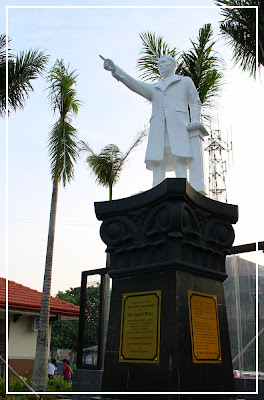 The statue does not hold a book nor a scroll, rather it portrays a Jose Rizal that is pointing forward with his finger. There is a local Pasigueño joke that Rizal is pointing to the person who shot him in Luneta. The original grey statue was facing the Pasig City Museum and was pointing northward. In 2011, it was replaced with a white and bigger statue as dedication to the 150th Birth Anniversary of Dr. Jose Rizal. The new statue is now facing the church (Pasig Cathedral) and is pointing eastward. This year, the 151st Birth Anniversary of Jose Rizal (ika-151 Taon ng Kapanganakan ni Jose Rizal is among the many events in celebration of the 439th Araw ng Pasig. The monument is located in Plaza Rizal, Barangay Malinao. is there a symbolism why is he pointing at something?